The 18-hole Cypress Point Club in Pebble Beach, CA is a private golf course that opened in 1928. Designed by Alister MacKenzie, Cypress Point Club measures 6509 yards from the longest tees and has a slope rating of 140 and a 72. The 18-hole Dunes Course at Monterey Peninsula Country Club in Pebble Beach, CA is a private golf course that opened in 1925. Designed by Charles Banks and Seth Raynor, Dunes Course at Monterey Peninsula Country Club measures 7090 yards from the longest tees and has a slope rating of 135 and a 74. The 18-hole Pebble Beach Golf Links in Pebble Beach, CA is a public golf course that opened in 1919. Designed by Douglas Grant and Jack Neville, Pebble Beach Golf Links measures 6828 yards from the longest tees and has a slope rating of 144 and a 74. 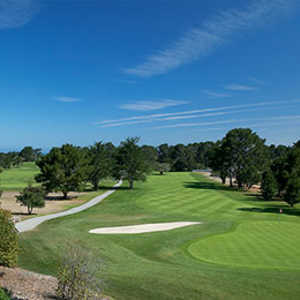 The 9-hole Peter Hay Par-3 at Pebble Beach Golf Links in Pebble Beach, CA is a resort golf course that opened in 1957. Designed by Peter Hay, Peter Hay Par-3 at Pebble Beach Golf Links measures 725 yards from the longest tees. The greens are rye grass. 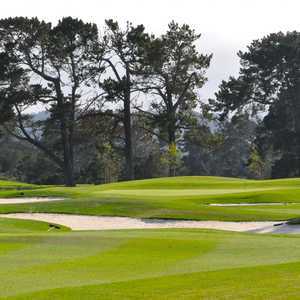 The 18-hole Poppy Hills Golf Course in Pebble Beach, CA is a public golf course that opened in 1986. Designed by Robert Trent Jones, Jr. , Poppy Hills Golf Course measures 6872 yards from the longest tees and has a slope rating of 140 and a 73 USGA rating. The 18-hole Shore Course at Monterey Peninsula Country Club in Pebble Beach, CA is a private golf course that opened in 1960. Designed by Bob E. Baldock and Jack Neville, Shore Course at Monterey Peninsula Country Club measures 6873 yards from the longest tees and has a slope rating of 133 and a 74. The 18-hole Spyglass Hill Golf Course in Pebble Beach, CA is a resort golf course that opened in 1966. 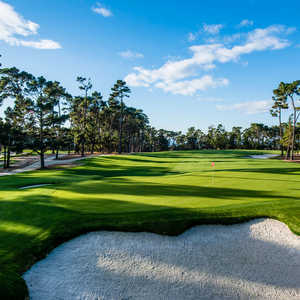 Designed by Robert Trent Jones, Sr. , Spyglass Hill Golf Course measures 6953 yards from the longest tees and has a slope rating of 147 and a 75. The 18-hole The Links at Spanish Bay in Pebble Beach, CA is a resort golf course that opened in 1987. Designed by Robert Trent Jones, Jr. , The Links at Spanish Bay measures 6821 yards from the longest tees and has a slope rating of 140 and a 74.